We are here to develop new medicines to deliver a new future for patients and their families by transforming gene regulation in disease. Above all we are champions for our patients. Trust, Respect, Compassion and Integrity define who we are. Fulcrum has assembled a team of leaders from the biopharmaceutical industry. Together they combine experiences in drug discovery and development with a steadfast dedication to making a positive impact in the lives of patients and their families. Robert Gould joined Fulcrum as president and CEO at the time of the company’s launch in 2016, bringing over 30 years of experience to the role. Previously, he served as president and CEO of Epizyme from 2010 to 2015. Prior to joining Epizyme, Robert served as director of novel therapeutics at the Broad Institute of MIT and Harvard from 2006 to 2010. Robert spent 23 years at Merck where he held a variety of leadership positions, culminating in the role of vice president, licensing and external research. Throughout his time at Merck, Robert was instrumental in advancing more than 20 compounds from discovery into clinical development in multiple therapeutic areas. Robert received a B.A. from Spring Arbor College and a Ph.D. from the University of Iowa and completed postdoctoral studies at the Johns Hopkins University. Owen Wallace joined Fulcrum in April 2017. He has more than two decades of experience in drug discovery and development across multiple therapeutic areas, including neuroscience, endocrine, infectious-, respiratory- and rare- diseases. He is the co-inventor of 7 clinical candidates, and has overseen teams who have progressed more than 30 compounds into clinical development. Prior to joining Fulcrum, Owen served as Head, Global Discovery Chemistry at Novartis, where he was responsible for teams and projects across multiple sites in several disease areas and the chemical genetics field. Prior to Novartis, he was the Site Scientific Leader with Eli Lilly & Company in the United Kingdom leading a cross-functional team focusing on Alzheimer’s disease and schizophrenia. Before that, he held research positions at Bristol-Myers Squibb, where he co-initiated a program on a novel mechanism for inhibiting HIV infection that is now in Phase 3 clinical trials. Owen earned his Ph.D. in chemistry from Yale University. Bryan Stuart joined Fulcrum as chief operating officer in December 2018, bringing over 20 years of experience building biopharma companies, including deal-making, capital raising and strategic and operational leadership. Most recently, he was the president and CEO of Yarra Therapeutics, a subsidiary of Array BioPharma focused on genetically defined rare diseases. Previously, Bryan served as president, then CEO of Kastle Therapeutics, a biopharmaceutical company focused on acquiring and developing treatments for rare diseases. Prior to Kastle, Bryan was the chief business officer of Civitas Therapeutics where he led the business development, capital raising, commercial and portfolio management functions, including the IPO and company sale to Acorda. He previously led business development and strategy at both EKR Therapeutics (acquired by Cheisi) and Ovation Pharmaceuticals (acquired by Lundbeck A/S), where he played key roles in each company’s growth and ultimate exit. Bryan began his career as a healthcare investment banker at William Blair & Company. He has an MBA from the Kellogg School at Northwestern University and a B.S. from the University of Illinois. Diego Cadavid joined Fulcrum in September 2016. He brings more than 17 years of experience in academic and biotechnology and pharmaceuticals research and drug development. Prior to joining Fulcrum Therapeutics, Diego was at Biogen for nearly 9 years where he was Senior Medical Director in the MS Clinical Development Group and lead of the CNS Remyelination Team. During much of his time at Biogen Diego was also consultant at the Center for Immunology and Inflammatory Diseases at the Massachusetts General Hospital in Boston. Before joining Biogen, Diego spent 9 years in academia at Rutgers-New Jersey Medical School where he was Associate Professor of Neurology and Neuroscience and worked on basic research on spirochetal brain infections and clinical research in Multiple Sclerosis. Diego completed postdoctoral research in Microbiology and Immunology and Internship in Internal Medicine at the University of Texas Health Science Center in San Antonio, Neurology Residency Training at Georgetown University Hospitals, and Neuropathology Fellowship at the Armed Forces Institute of Pathology. Diego holds an MD from Universidad Javeriana in Bogota, Colombia. Lucienne Ronco joined Fulcrum at the company’s launch in 2016. She brings more than 17 years of industry experience in translational medicine, drug discovery, biotechnology and pharmaceuticals. Prior to joining Fulcrum, Lucienne was a director within the Center for the Development of Therapeutics at the Broad Institute of MIT and Harvard. Prior to her work at the Broad Institute, she was president of research at Catabasis Pharmaceuticals. Previously in her career, Lucienne worked for 10 years at AstraZeneca Boston, where she held positions of increasing responsibility, including global director of translational medicine, local director for the departments of in vivo pharmacology, informatics and disease area research, and the breast disease team scientific lead. Prior to AstraZeneca, she was a senior research investigator at the Pfizer Discovery Technology Center. Lucienne completed postdoctoral research at Harvard Medical School. She holds a Ph.D. in biological chemistry from the University of California, Los Angeles. Aaron Chang joined Fulcrum in 2016 bringing over 15 years of experience. He was previously Executive Director of the Center for Computational Biology and Bioinformatics (CCBB) at UC San Diego bringing together omics analysis, systems biology and cloud computing to over 100 research groups. He was also an Associate Investigator at the Baylor Institute for Immunology Research heading a bioinformatics group involved in translational research efforts centered on cancer vaccine and liver transplantation studies. Aaron served as Associate Director of Computational Biology at Regulus Therapeutics during its initial startup phase. His group there identified several key miRNA targets currently in clinical development. At Rosetta Inpharmatics (Merck), he was a member of the Pathway Informatics team that developed the first in-house systems biology tools for target identification. Aaron was a National Library Medicine Postdoctoral Fellow in Biomedical Informatics at the University of Washington. He completed his Ph.D. in Genetics at Harvard University working on transcription factors governing hematopoiesis. He holds an S.B in Biology from MIT. Lorin (Drew) Thompson joined Fulcrum shortly after launch in summer, 2016 and brings more than 18 years of experience in medicinal chemistry to the Molecular Sciences organization. Drew joined Fulcrum from Bristol-Myers Squibb, where he led both early- and full-phase drug discovery programs in both neuroscience and genetically-defined diseases. As a project team leader, teams under Drew’s direction nominated 2 IND candidates including an allosteric modulator of gamma secretase targeting Alzheimer’s disease and an NR2B-selective NAM for treatment-resistant depression. He also helped establish the discovery chemistry platforms group and served on the leadership team while guiding chemistry efforts around phenotypic screening and target identification. Now with Fulcrum he leads the team responsible for characterization of molecular targets including medicinal chemistry, structural biology and biophysics, enzymology, and DMPK. Drew holds a Ph. D. from the University of California, Berkeley and a B.S. in chemistry from the University of North Carolina at Chapel Hill. Walt Kowtoniuk joined Fulcrum after serving as a senior associate at Third Rock Ventures where he led the creation of Fulcrum. Walt joined Third Rock in 2013 to focus on new company formation in the rare genetic disease space. While at Third Rock he also supported the partner development team and contributed to the formation of multiple new companies focused on delivering transformative medicines to patients. Prior to joining Third Rock, Walt was a manager at Clarion Healthcare, a boutique strategy consulting firm in the life sciences industry. At Clarion, Walt focused on developing new business strategies and providing commercial insight into early product development in the rare disease space. He has also worked with pre-commercial companies to build and prepare the organization for product commercialization. Walt has a Ph.D. in chemical biology from Harvard University and a B.S. in biochemistry, molecular biology and philosophy from Gettysburg College. Kim Hazen joined Fulcrum in September 2017 with over 25 years of experience in Human Resources. Most recently, she was Vice President of Human Resources at Warp Drive Bio, where she led efforts to build a drug discovery culture and core values to match with an emphasis on elite performance. Prior to joining Fulcrum and Warp Drive Bio, Kim served as the Executive Director of Human Resources at Aegerion Pharmaceuticals and as Head of Human Resources at Broad Institute. Before joining the life sciences industry, she worked on the investment side of human resources at Pioneer Investments, Fidelity Investments, Liberty Mutual and Bank of America. Kim received a B.A. in psychology from SUNY Potsdam and her MBA from Boston University. Peter Thomson joined Fulcrum in 2018, bringing over 15 years of experience in the life sciences industry. Most recently, he was a consultant for three Third Rock Ventures portfolio companies, where he served as interim head of finance. Before that, he served as head of finance at BIND Therapeutics, where he was responsible for all finance and accounting activities, developed the corporate valuation for the company and played an integral role in the company’s sale to Pfizer. Prior to BIND, he was senior director of finance at Ovascience and director of finance at Millenium: The Takeda Oncology Company. In addition, he held positions on the finance teams at Boston Scientific Corporation, Infomedics, Inc., and the Hewlett-Packard Company. Peter earned a B.A. from Brown University and an MBA from the University of Chicago Booth School of Business. Chris Moxham joined Fulcrum in January 2019. He has over 20 years of drug discovery experience, primarily spent at Eli Lilly and Company where he most recently served as vice president, quantitative biology. In this role, he helped grow Lilly’s oncology pipeline, developed critical biopharma and academic partnerships and established a state-of-the-art lab facility. Previously, he was associate vice president, oncology research at Lilly where he established and led the company’s biomarker group. Moxham began his tenure at Lilly as a research scientist. He also spent two years as a senior research fellow at Merck, where he supported a portfolio of projects centered on Alzheimer’s disease and led work that resulted in a clinical candidate. Moxham has a B.S. in biological sciences from Cornell University and a Ph.D. in molecular and cellular pharmacology from the State University of New York at Stony Brook. He also conducted postdoctoral training at SUNY Stony Brook, sponsored by the National Institutes of Health. The founders of Fulcrum Therapeutics bring together world-class expertise and unparalleled achievements in gene regulation, genetics, cell biology and screening and computation in the pursuit of innovative new therapies. In addition to having a passion for research, each scientific founder is also passionate about harnessing his or her research to transform the treatment of disease. Bradley Bernstein received his B.S. in physics from Yale University and his M.D. and Ph.D. from the University of Washington School of Medicine. He completed a residency in clinical pathology at Brigham and Women’s Hospital, and carried out postdoctoral research at Harvard University with Stuart Schreiber. He joined the faculty of Massachusetts General Hospital and Harvard Medical School in 2005. His research focuses on epigenetics ­­— changes in gene activity governed by influences outside the genes themselves. His work is notable for the discovery of epigenetic mechanisms in stem cells and the annotation of thousands of enhancer ‘switches’ in the human genome relevant to common disease. He co-directs the Epigenomics Program at the Broad Institute and oversees a production center for the NHGRI-sponsored ENCODE project, which seeks to catalog all of the working parts of the genome. His honors and awards include the Paul Marks Prize for Cancer Research, a Research Professorship from the American Cancer Society, an Early Career Scientist award from the Howard Hughes Medical Institute, a Career Award in the Biomedical Sciences from the Burroughs Wellcome Fund, a junior faculty award from the Culpeper Foundation and election into the American Society for Clinical Investigation. Michael Green received his M.D. and Ph.D. from Washington University School of Medicine in 1981. He carried out postdoctoral work at Harvard University, where he joined as a faculty member in 1984. In 1990, he joined the Program in Molecular Medicine at the University of Massachusetts Medical School, and served as the director of the Program of Gene Function and Expression from 1999 to 2014. He has made pioneering contributions to the understanding of the mechanisms that regulate gene expression in eukaryotes and how alterations in gene expression contribute to cancer and other human diseases. Recently he has used transcription-based approaches and functional screens to identify new genes and regulatory pathways involved in epigenetic regulation and cancer, which have important therapeutic implications. As a young investigator he was the recipient of the Presidential Young Investigators Award (1985), the Searle Scholar Award (1986), the McKnight Neuroscience Award (1991) and was a Harvey Lecturer (1993). He is an elected member of the National Academy of Sciences (2014), National Academy of Medicine (2015) and the European Molecular Biology Organization (2010). Rudolf Jaenisch earned his M.D. from the University of Munich in 1967. After conducting postdoctoral work in bacteriophages at the Max Planck Institute in Munich, he held research positions at Princeton University, the Fox Chase Institute for Cancer Research and the Salk Institute. From 1977 to 1984 he was the head of the Department of Tumor Biology at the Heinrich Pette Institute at the University of Hamburg. He joined MIT in 1984. His central research interest is to understand epigenetic regulation of gene expression in mammalian development and disease. He is a pioneer in the understanding of how to transdifferentiate cells from one type to another. His work with embryonic stem cells is providing fundamental discoveries for the field of regenerative medicine. His numerous awards and honors include the Genetics Prize from the Gruber Foundation (2001), election to the National Academy of Sciences (2003), the Max Delbruck Medal (2006), the National Medal of Science (2010), the Wolf Prize in Medicine (2011) and the Otto Warburg Medal (2014). Jeannie Lee received her B.A. in biochemistry and molecular biology from Harvard University and her M.D. and Ph.D. degrees from the University of Pennsylvania School of Medicine, with postgraduate training at the Whitehead Institute/MIT and Massachusetts General Hospital. She is a pioneer in the field of epigenetic regulation by long noncoding RNAs (lncRNA) and is known for her work on Xist, Tsix RNA and X-inactivation, as well as for establishing a link between lncRNA and chromatin complexes. Her honors and awards include the Lurie Prize from the Foundation for the NIH (2016); election to the National Academy of Science (2015); the Distinguished Graduate Award of the University of Pennsylvania School of Medicine (2014); the NIH MERIT Award (2011); the Molecular Biology Prize from the National Academy of Sciences (2010); appointment as a Fellow of the AAAS (2010); the Pew Scholars Award (2000); and the Basil O’Connor Scholar Award (1998). She was also chief resident of clinical pathology at the MGH (1994). She has served on the Board of Directors of the Genetics Society of America and currently serves on the Board of Overseers for the Boston Philharmonic Orchestras. Danny Reinberg received his B.S. in biochemistry from Catholic University in Valparaiso, Chile and a Ph.D. in molecular biology from the Albert Einstein College of Medicine. He is a world-recognized leader in the fields of mammalian transcriptional regulation, chromatin dynamics and epigenetic regulation. His numerous advances are detailed in over 180 publications and his key contributions include identifying the structural and functional characterization of critical components of the human gene expression machinery; discovering several chromatin remodeling factors and key insights into the mechanisms by which genes are activated and repressed in the context of chromatin; and purifying and characterizing several histone methyltransferases and chromatin modifying complexes that have shed great insight into the regulatory interplay between histone modification and gene expression. He is an elected member of the National Academy of Medicine (2013) and the National Academy of Sciences (2015). As Fulcrum advances its lead programs in Fragile X syndrome (FXS) and facioscapulohumeral muscular dystrophy (FSHD) it is establishing CNS and muscular dystrophy franchises. The Scientific Advisory Board brings expertise in disease, biology, and physiology in order to advance new programs through drug discovery and development and to deliver on the promise of genomic medicine. Peter L. Jones is an expert in epigenetic mechanisms of gene regulation with a focus on muscle development and disease. Peter is a leader in understanding the epigenetic disruption and pathogenic mechanisms underlying Facioscapulohumeral Muscular Dystrophy (FSHD). Peter received his Bachelor’s degree in Microbiology from Miami University (Ohio) and his Ph.D. in Genetics and Molecular Biology from Emory University. He completed his postdoctoral training with Dr. Alan Wolffe in the Laboratory of Molecular Embryology at the National Institutes of Health and the Eunice Shriver National Institute of Child Health and Human Development. Peter currently serves as an Associate Professor of Pharmacology at the Center for Molecular Medicine at the University of Nevada. Previously in his career, Peter served as an affiliate investigator with the Senator Paul D. Wellstone Muscular Dystrophy Cooperative Research Center for FSHD and was a Principal Scientist at the Boston Biomedical Research Institute, a private research institute focused on fundamental questions in muscle biology. Prior to that, he was an Assistant Professor at the University of Illinois at Urbana-Champaign in the Department of Cell and Developmental Biology. Most recently, Peter was an Associate Professor in the Departments of Cell and Developmental Biology and Neurology at the University of Massachusetts Medical School. Leslie Leinwand is a renowned muscle physiologist with broad expertise into the genetic underpinnings of heart and skeletal muscle defects. Leslie received her Bachelor’s degree from Cornell University and her Ph.D. at Yale University, and completed her postdoctoral training at Rockefeller University. She was Chair of the Department of Molecular, Cellular and Developmental Biology at the University of Colorado. She established and co-directs the University of Colorado’s Cardiovascular Research Institute (CU-CVI), a collaborative group of physicians, molecular biologists and geneticists. The team works to integrate research and clinical applications, as well as initiate effective treatment programs and preventive therapies. Her research focuses on how cardiac and skeletal muscle adapt to stimuli, particularly the pathways involved in heart enlargement in response to exercise and disease. She is the Chief Scientific Officer of the BioFrontiers Institute at the University of Colorado and a Howard Hughes Medical Investigator Professor. Leinwand has authored more than 300 scientific publications and founded three biotechnology companies, Myogen Inc., Hiberna, Inc. and MyoKardia, Inc. Myogen, a publicly traded company was acquired by Gilead in 2006. MyoKardia, which is publicly traded, has a small molecule in clinical trials for inherited cardiomyopathy. Steve Warren has made seminal discoveries related to FXS and its potential treatment. Steve led an international group that first isolated the FMR1 gene responsible for Fragile X syndrome in 1991, and is now a leader in the effort to identify new genomically focused therapeutic approaches to treating this condition. Steve received his Ph.D. in Human Genetics from Michigan State University in 1981, and completed his postdoctoral training at the University of Illinois College of Medicine. Steve currently serves as William Patterson Timmie Professor of Human Genetics, Charles Howard Candler Chair in Human Genetics, and the Founding Chair of the Department of Human Genetics. He also holds secondary appointments in the Departments of Pediatrics and Biochemistry. In addition to his groundbreaking work in the field, Steve is past president of the American Society of Human Genetics and past Editor-in-Chief of The American Journal of Human Genetics. He is an elected member of the National Academy of Science, the National Academy of Medicine, and the National Academy of Arts and Sciences. Marius Wernig is an expert in the molecular mechanisms that determine specific cell fates, and his laboratory recently identified a pool of transcription factors that are sufficient to convert skin fibroblasts directly into functional neuronal cells termed induced neuronal (iN) cells. Marius earned his M.D. and Ph.D. from the Technical University of Munich. He completed clinical training in neuropathology and general pathology at the University of Bonn and was a postdoctoral fellow at the Whitehead Institute for Biomedical Research. Marius currently serves as Associate Professor of Pathology and Chemical and Systems Biology in the Institute for Stem Biology and Regenerative Medicine at Stanford University. Dr. H. Lee Sweeney is the director of the Myology Institute at University of Florida (UF), where he is also a professor. Dr. Sweeney is one of the world’s premier neuromuscular disease researchers, with expertise across cardiovascular disease, skeletal muscle disorders and molecular biology – specifically the molecular motors of the myosin superfamily. He is known for creating the first visualization of structural rearrangement of the myosin lever arm, as well as for his use of gene therapy to block the loss of age-related muscle size and strength in mice. Prior to joining the faculty at UF, Dr. Sweeney was the William Maul Measey Professor and chairman of physiology at the University of Pennsylvania, where he is now an emeritus professor of physiology. He was elected as a fellow of the American Heart Association in 2001, a fellow of the Biophysical Society in 2017, and has been the director of a Paul Wellstone Muscular Dystrophy Cooperative Center since 2005. Sweeney has a bachelor’s degree in biochemistry from the Massachusetts Institute of Technology, a Master of Arts in physiology from Harvard University and a Ph.D. in physiology and biophysics from Harvard University. 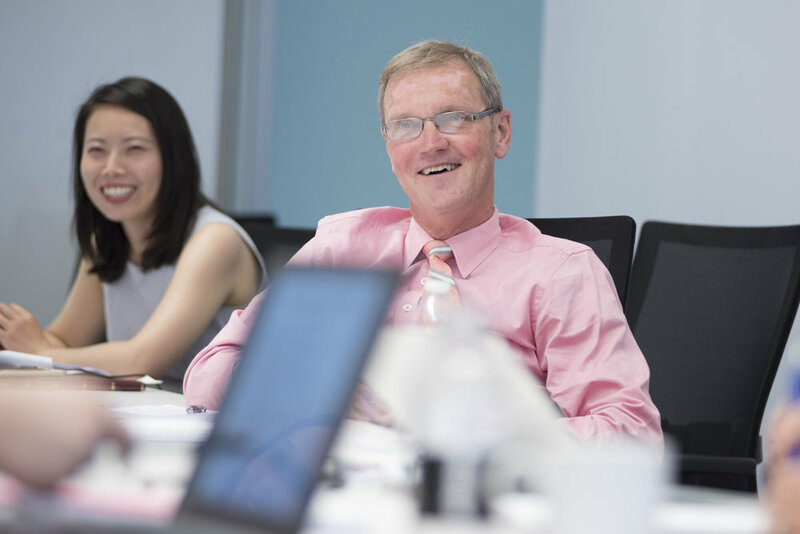 Fulcrum’s Board of Directors is composed of accomplished biopharma leaders who bring their experience in science, drug development, commercialization and strategy to our efforts to develop novel medicines. Mark Levin is a co-founder of Third Rock Ventures and an industry leader with 40 years of experience, including more than 30 years launching and building biotechnology companies. At Third Rock, Mark focuses on the formation and development of business strategy for the firm’s portfolio companies, as well as actively identifying and evaluating new investments. Prior to becoming involved in the creation of Fulcrum, Mark played significant roles in launching and building a number of the firm’s portfolio companies, including Voyager Therapeutics, Corvia Medical (previously DC Devices), NinePoint Medical, Eleven Biotherapeutics, Foundation Medicine, Constellation Pharmaceuticals and Warp Drive Bio. Before founding Third Rock, Mark was co-founder of Mayfield Fund's life sciences effort, where he was also the founding chief executive officer of Tularik, Cell Genesys/Abgenix, Focal, Stem Cells and Millennium Pharmaceuticals. Mark served as CEO of Millennium Pharmaceuticals for 12 years. Earlier in his career, he was an engineer and project leader at Lilly and Genentech. Mark holds an M.S. in chemical and biochemical engineering from Washington University. Dr. James Collins is the Termeer Professor of Medical Engineering and Science in the Institute for Medical Engineering and Science and the Department of Biological Engineering at the Massachusetts Institute of Technology, and is also affiliated with the Broad Institute and the Wyss Institute. He is a renowned expert in synthetic biology and systems biology, and their applications in biotechnology and medicine. He has received numerous awards, including a Rhodes Scholarship, a MacArthur Fellowship, and a National Institutes of Health (NIH) Director’s Pioneer Award. Dr. Collins is an elected member of the National Academy of Sciences, the National Academy of Engineering, the National Academy of Medicine, and the American Academy of Arts and Sciences; and is a charter fellow of the National Academy of Inventors. Dr. Alan Ezekowitz is President and CEO of Abide Therapeutics, a company he co-founded in 2011. Formerly, he was the Senior Vice President and Franchise Head for disease areas including bone, respiratory, immunology, endocrine and dermatology at Merck Research Laboratories. Prior to Merck, Dr. Ezekowitz was the Charles Wilder Professor of Pediatrics at the Harvard Medical School and served as the Chief of Pediatric Services at the Mass General Hospital for Children and the Partners Healthcare System. Additionally, he directed the Laboratory of Developmental Immunology at Massachusetts General Hospital. Dr. Ezekowitz is a leader in the field of developmental immunology and has 150 publications. He is a member of the American Society of Clinical Investigation, a Fellow of the American Association for the Advancement of Science, and has served on multiple NIH subcommittees. Jim Geraghty joined Third Rock Ventures as an entrepreneur-in-residence in 2013 and focuses on creating companies dedicated to improving the lives of patients with rare genetic diseases and supporting existing portfolio companies in the rare disease space, such as Fulcrum. Jim is an industry leader with 30 years of strategic and leadership experience, including more than 20 years developing and commercializing therapies for rare diseases. He has taken an active leadership role as board member and former interim CBO of Voyager Therapeutics. Prior to Third Rock, Jim served as senior vice president, North America strategy and business development at Sanofi. Before Sanofi, Jim spent 20 years at Genzyme, where his roles included senior vice president of international development, president of Genzyme Europe and general manager of Genzyme's cardiovascular business. He also served as chairman and chief executive officer of GTC Biotherapeutics (formerly Genzyme Transgenics), which he founded and took public. Jim oversaw Genzyme's Humanitarian Assistance for Neglected Diseases program, under which the company supported innovative therapeutic programs on a non-commercial basis. He is chairman of Idera Pharmaceuticals, a member of the Joslin Diabetes Center board of trustees and serves on the board of BIO Ventures for Global Health. A graduate of the Yale Law School, Jim also holds a master’s degree from the University of Pennsylvania and a bachelor’s degree from Georgetown University. Robert Gould joined Fulcrum as president and CEO at the time of the company’s launch in 2016, bringing over 30 years of experience to the role. Previously, he served as president and CEO of Epizyme from 2010 to 2015. Prior to joining Epizyme, Robert served as director of novel therapeutics at the Broad Institute of MIT and Harvard from 2006 to 2010. Robert spent 23 years at Merck where he held a variety of leadership positions, culminating in the role of president, licensing and external research. Throughout his time at Merck, Robert was instrumental in advancing more than 20 compounds from discovery into clinical development in multiple therapeutic areas. Robert received a B.A. from Spring Arbor College and a Ph.D. from the University of Iowa and completed postdoctoral studies at the Johns Hopkins University. Kate Haviland serves as the Chief Business Officer at Blueprint Medicines, a publicly-traded biopharmaceutical company that is a leader in the discovery and development of targeted therapies to treat cancer and rare genetic diseases. Kate is a member of the executive leadership team responsible for the business development, alliance management, corporate affairs, commercial strategy and operations, new product planning, program management and information technology functions. Prior to joining Blueprint in 2016, Kate was the Vice President of Oncology and Rare Diseases Leadership at Idera Pharmaceuticals. In this role, she led all aspects of the product development and new product planning strategy for the company’s oncology and rare disease pipeline programs. Previously, Kate worked at Sarepta Therapeutics as the Head of Commercial Development, at PTC Therapeutics in commercial development as the product lead for Translarna, and at Genzyme in corporate development, before moving into program management for two enzyme replacement therapies in the personalized genetic health business unit. Before joining Genzyme, Kate spent five years as a life science strategy consultant. Kate's academic background includes a B.A. from Wesleyan University with a double major in Biochemistry and Economics and an MBA from Harvard Business School. Kate is a member of the Corporate Advisory Council for the National Tay-Sachs and Allied Disease Association, is an advisory board member at Peeled Snacks Inc., a consumer health food company, and is a member of the inaugural class of Women in Bio’s Boardroom Ready Program, the BioPharma Executive Council and the Harvard Business School Healthcare Alumni Association. Jim Tananbaum founded Foresite Capital in 2011. Throughout his career, he has excelled at systematic and deep technical analysis of healthcare opportunities, while supporting the growth of companies from small enterprises into enduring franchises. Prior to founding Foresite Capital, Jim co-founded two leading biopharmaceutical companies: GelTex Pharmaceuticals, which brought two drugs to market for less than $80 million, and Theravance, Inc., which shares GSK’s respiratory franchise through a joint venture, Innoviva. He is also a founding partner of Prospect Venture Partners and earlier in his career was a partner at Sierra Ventures, where he helped establish its healthcare services investment practice. Tananbaum has led numerous investments, including Amira Pharmaceuticals, Amerigroup, Healtheon and Jazz Pharmaceuticals. He has an M.D. from Harvard Medical School, an MBA from Harvard Business School and an M.S. from the Massachusetts Institute of Technology. Fulcrum Therapeutics is backed by top-tier life sciences investors.